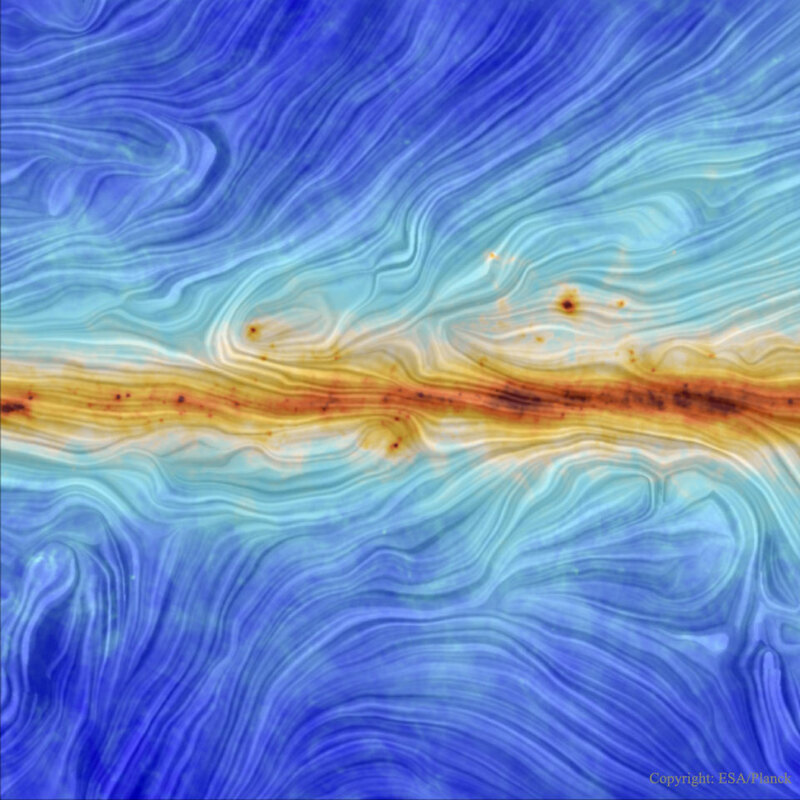 What does the magnetic field of our Galaxy look like? It has long been known that a modest magnetic field pervades our Milky Way Galaxy because it is seen to align small dust grains that scatter background light. Only recently, however, has the Sun-orbiting Planck satellite made a high-resolution map of this field. Color coded, the 30-degree wide map confirms, among other things, that the Galaxy's interstellar magnetism is strongest in the central disk. The revolution of charged gas around the Galactic center creates this magnetism, and it is hypothesized that viewed from the top, the Milky Way's magnetic field would appear as a spiral swirling out from the center. What caused many of the details in this and similar Planck maps -- and how magnetism in general affected our Galaxy's evolution -- will likely remain topics of research for years to come. There is a road that connects the Northern to the Southern Cross but you have to be at the right place and time to see it. The road, as pictured above, is actually the central band of our Milky Way Galaxy; the right place, in this case, is dark Laguna Cejar in Salar de Atacama of Northern Chile; and the right time was in early October, just after sunset. Many sky wonders were captured then, including the bright Moon, inside the Milky Way arch; Venus, just above the Moon; Saturn and Mercury, just below the Moon; the Large and Small Magellanic Clouds satellite galaxies, on the far left; red airglow near the horizon on the image left; and the lights of small towns at several locations across the horizon. One might guess that composing this 30-image panorama would have been a serene experience, but for that one would have required earplugs to ignore the continued brays of wild donkeys. Comet McNaught of 2007 has been, so far, the most photogenic comet of our time. After making quite a show in the northern hemisphere in early 2007 January, the comet moved south and developed a long and unusual dust tail that dazzled southern hemisphere observers. 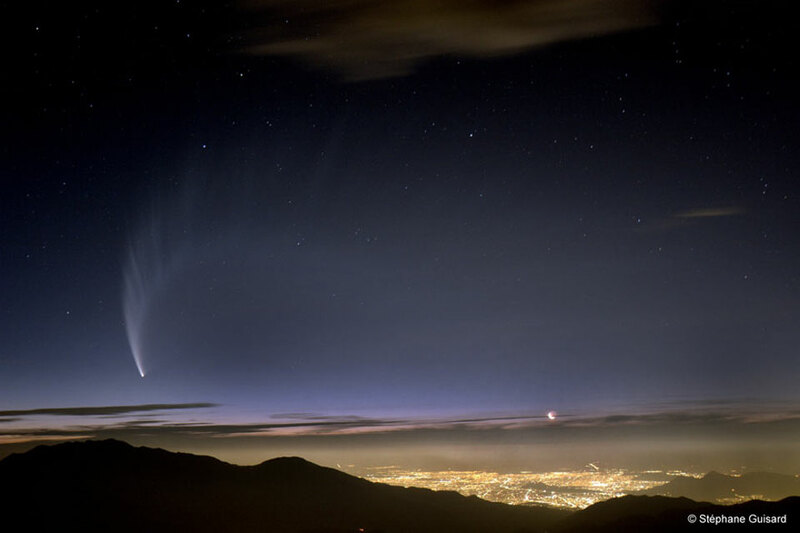 In this image, Comet McNaught was captured above Santiago, Chile. The bright comet dominates on the left while part of its magnificent tail spreads across the entire frame. From this vantage point in the Andes Mountains, one looks up toward Comet McNaught and a magnificent sky, across at a crescent moon, and down on clouds, atmospheric haze, and the city lights. The current year -- 2013 -- holds promise to be even better for comets than 2007. In early March, Comet PANSTARRS is on track to become visible to the unaided eye, while at the end of the year Comet ISON shows possibilities that include casting a tail that spreads across the sky, breaking up, and even becoming one of the brightest comets in recorded history. M78 isn't really hiding in planet Earth's night sky. About 1,600 light-years away and nestled in the nebula rich constellation Orion, the large, bright, reflection nebula is well-known to telescopic skygazers. But this gorgeous image of M78 was selected as the winner of the Hidden Treasures 2010 astrophotography competition. 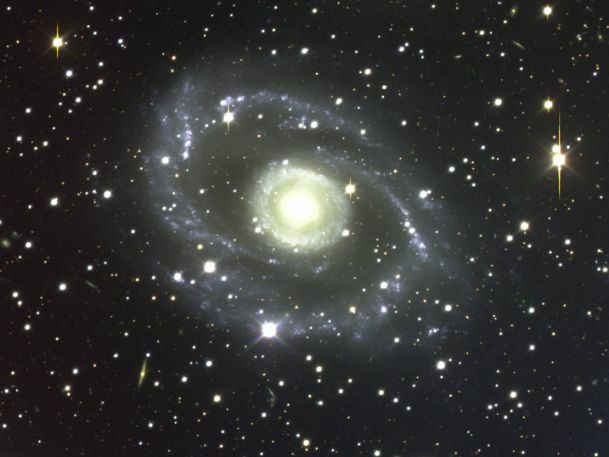 Held by the European Southern Observatory (ESO), the competition challenged amateur astronomers to process data from ESO's astronomical archive in search of cosmic gems. 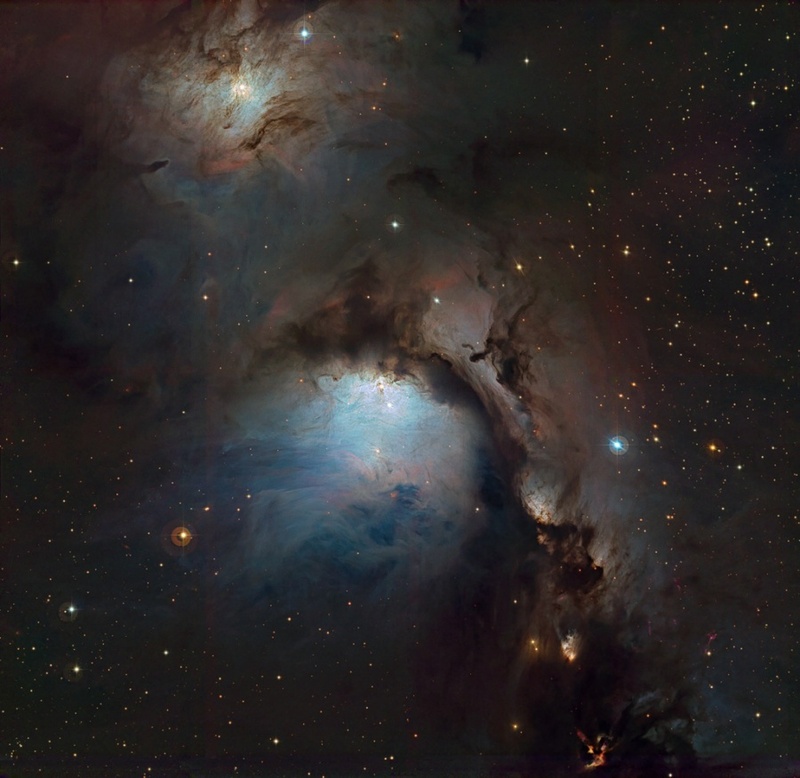 The winning entry shows off amazing details within bluish M78 (center) embraced in dark, dusty clouds, along with a smaller reflection nebula in the region, NGC 2071 (top). Yellowish and even more compact, the recently discovered, variable McNeil's Nebula is prominent in the scene below and right of center. Based on data from ESO's WFI camera and 2.2 meter telescope at La Silla, Chile, this image spans just over 0.5 degrees on the sky. That corresponds to 15 light-years at the estimated distance of M78. What's that behind Titan? It's another of Saturn's moons: Tethys. The robotic Cassini spacecraft orbiting Saturn captured the heavily cratered Tethys slipping behind Saturn's atmosphere-shrouded Titan late last year. The largest crater on Tethys, Odysseus, is easily visible on the distant moon. Titan shows not only its thick and opaque orange lower atmosphere, but also an unusual upper layer of blue-tinted haze. 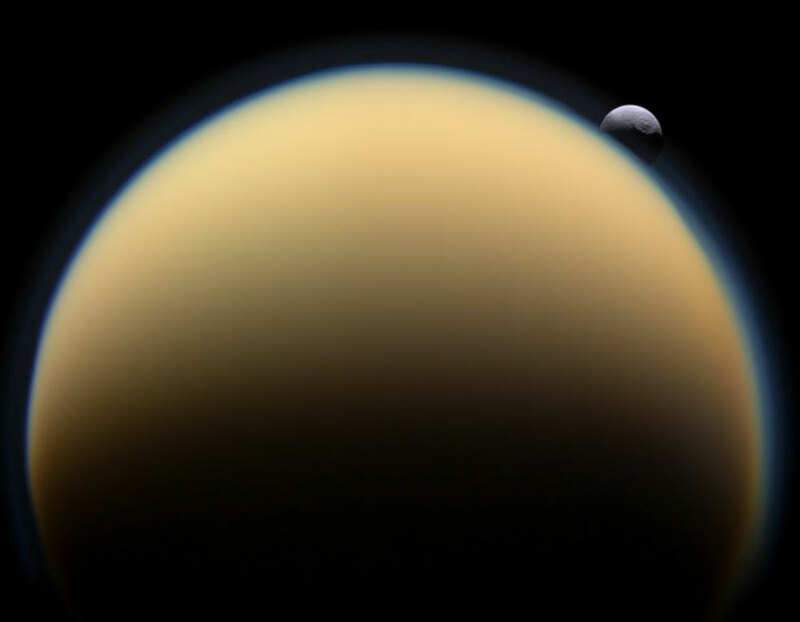 Tethys, at about 2 million kilometers distant, was twice as far from Cassini as was Titan when the above image was taken. In 2004, Cassini released the Hyugens probe which landed on Titan and provided humanity's first views of the surface of the Solar System's only known lake-bearing moon. Have you ever seen the band of our Milky Way Galaxy? In a clear sky from a dark location at the right time, a faint band of light becomes visible across the sky. Soon after your eyes become dark adapted, you might spot the band for the first time. It may then become obvious. Then spectacular. One reason for a growing astonishment might be the realization that this fuzzy swath contains billions of stars and is the disk of our very own spiral galaxy. Since we are inside this disk, the band appears to encircle the Earth. Visible in the above image, high above in the night sky, the band of the Milky Way Galaxy arcs. The bright spot just below the band is the planet Jupiter. 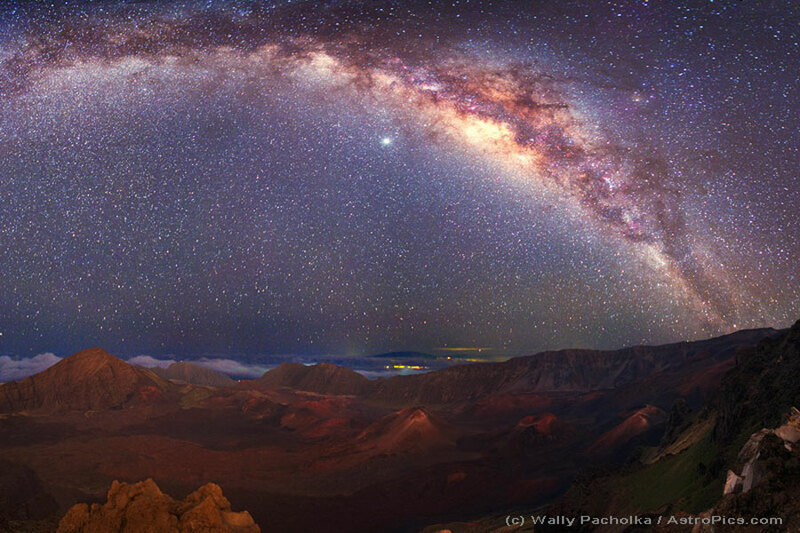 In the foreground lies the moonlit caldera of the volcano Haleakala, located on the island of Maui in Hawaii, USA. A close look near the horizon will reveal light clouds and the dark but enormous Mauna Kea volcano on the Big Island of Hawaii. If you have never seen the Milky Way band or recognized the planet Jupiter, this year may be your chance. Because 2009 is the International Year of Astronomy, an opportunity to look through a window that peers deep into the universe may be coming to a location near you. Have you ever seen the planet Mercury? Because Mercury orbits so close to the Sun, it never wanders far from the Sun in Earth's sky. 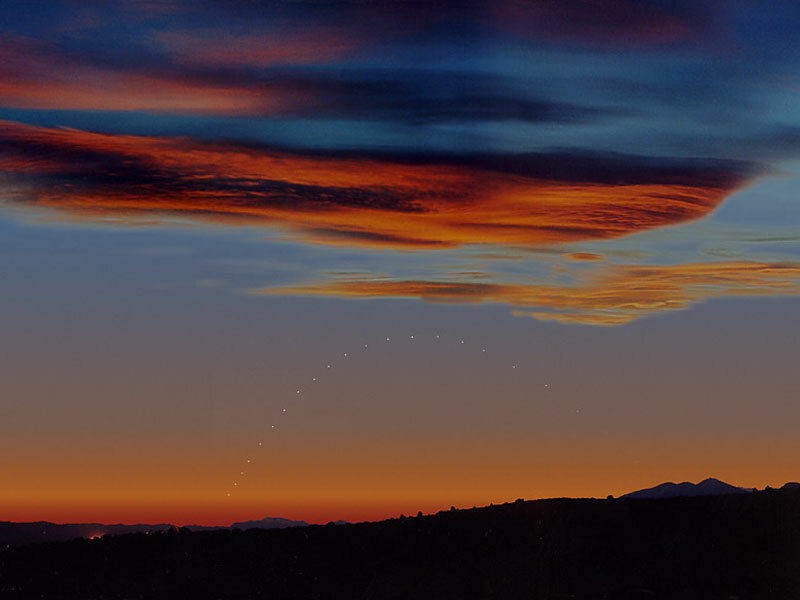 If trailing the Sun, Mercury will be visible low on the horizon for only a short while after sunset. If leading the Sun, Mercury will be visible only shortly before sunrise. So at certain times of the year an informed skygazer with a little determination can usually pick Mercury out from a site with an unobscured horizon. Above, a lot of determination has been combined with a little digital trickery to show Mercury's successive positions during March of 2000. Each picture was taken from the same location in Spain when the Sun itself was 10 degrees below the horizon and superposed on the single most photogenic sunset. 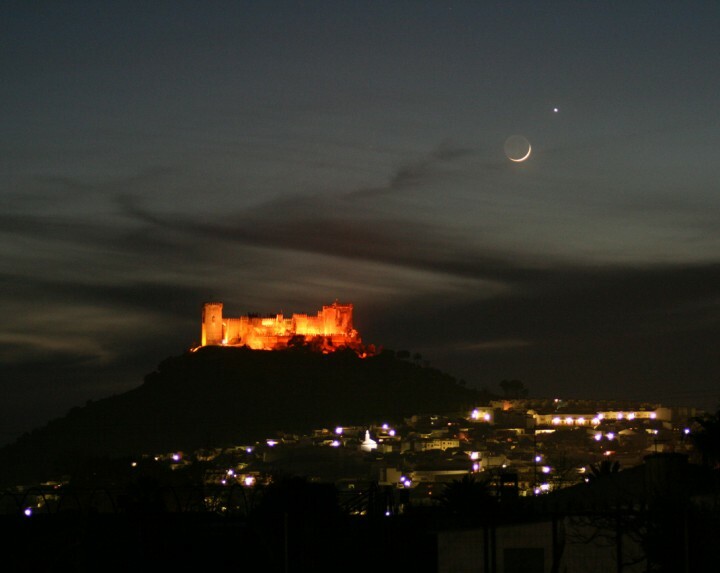 Mercury is currently visible in the western sky after sunset, but will disappear in the Sun's glare after a few days. 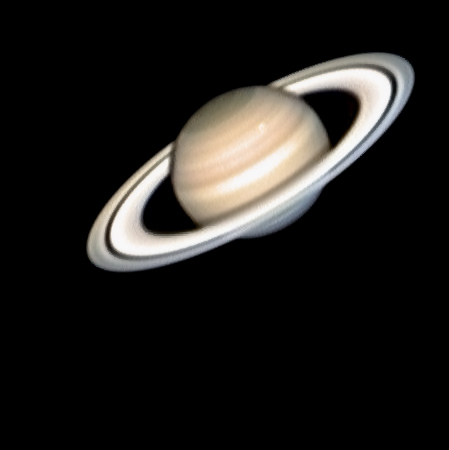 Presently at opposition in planet Earth's sky, Saturn is well placed for telescopic observations. On Wednesday two amateur astronomers took full advantage of the situation from Melun, near Paris, France. With a 12 inch diameter telescope and web cam they recorded this sharp image of the ringed gas giant and made an exciting discovery -- a new storm on Saturn. The storm appears as the white spot visible here in Saturn's southern hemisphere (south is toward the top in the picture). In particular, the storm seems to correspond with an outburst of radio noise detected by the Cassini spacecraft. The phenomenon is likely similar to the Dragon Storm recorded by Cassini's instruments early last year. That storm is thought to be analogous to a terrestrial thunderstorm, with radio noise produced in high-voltage lightning discharges. 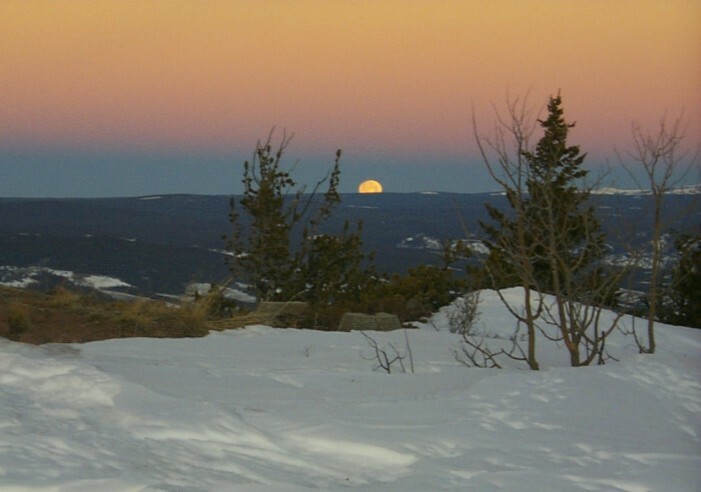 A nearly full Moon and planet Earth's shadow set together in this scene captured Monday from snowy Mt. Jelm, home of the Wyoming Infrared Observatory. For early morning risers (and late to bed astronomers), shadow set in the western sky is a daily apparition whose subtle beauty is often overlooked in favor of the more colorful eastern horizon. Extending through the dense atmosphere, Earth's setting shadow is seen in this picture as a dark blue band along the distant horizon, bounded above by a pinkish glow or antitwilight arch. Also known as the Belt of Venus, the arch's lovely color is due to backscattering of reddened light from the rising Sun. The setting Moon's light is also reddened by the long sight-line through the atmosphere and echoes the dawn sky's yellow-orange hues. 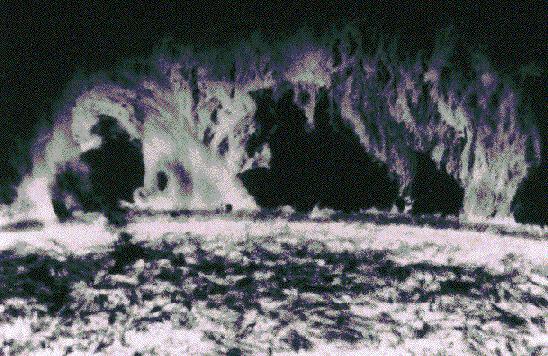 You've just woken up in a small crater on Mars. The surrounding landscape is barren, strange, and alien. You've never been on this world before. You transmit pictures that are instantly rebroadcast all over your home world. You are the eyes for billions of people. You seek adventure. Your mission is to explore this strange new world and search for signs of pre-historic life. You have six wheels, one arm, and X-ray eyes. 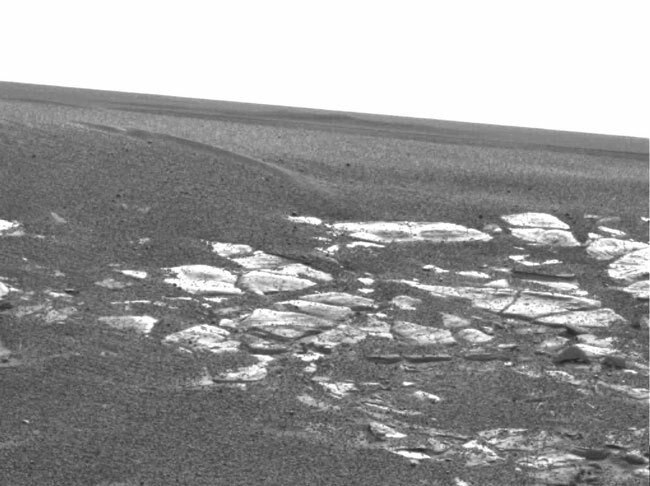 Surrounding you, pictured above, is iron sand and light-colored protrusions that might be bedrock. You are the Opportunity Rover that landed on Mars just this past weekend. What is happening to molecular cloud BHR 71? Quite possible, a binary star system is forming inside. Most stars in our Galaxy are part of binary star systems, but few have ever been seen in formation. Recent observations of dust-darkened Bok Globule BHR 71, however, show evidence for two young stars forming deep in the cloud, likely close enough to form a binary. Isolated BHR 71 spans about one light year and lies only about 600 light years away in the southern sky. The brighter embedded star -- not visible here -- is about 10 times as bright as the Sun and drives the jet that swept out the empty lane. 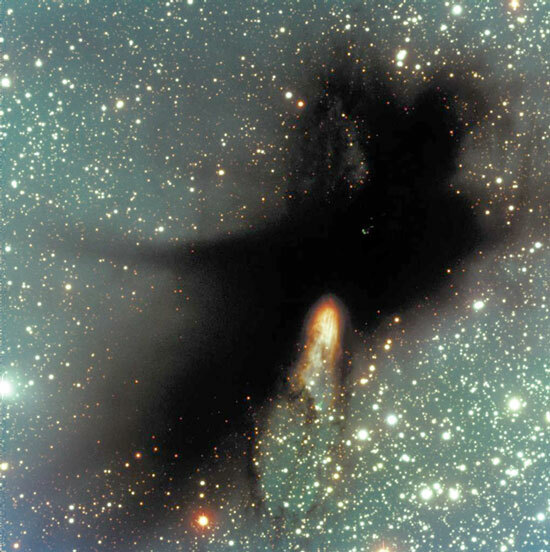 The above four-color image was taken with a Very Large Telescope in Chile. During 1968, the Apollo 8 crew flew from the Earth to the Moon and back. The crew, consisting of Frank Borman, James Lovell, and William Anders, were launched atop a Saturn V rocket on December 21, circled the Moon ten times in their command module, and landed back on Earth on December 27. The Apollo 8 mission's impressive list of firsts includes: the first humans to journey to the Earth's Moon, the first manned flight using the Saturn V, and the first to photograph the Earth from deep space. 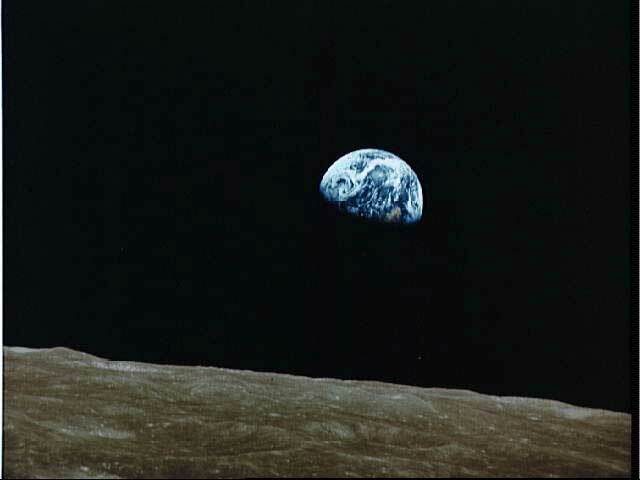 The famous picture above, showing the Earth rising above the Moon's limb as seen from lunar orbit, was a marvelous gift to the world. While orbiting the planet during their June 1998 mission, the crew of the Space Shuttle Discovery photographed this view of two moons of Earth. Thick storm clouds are visible in the lovely blue planet's nurturing atmosphere and its largest artificial moon, the spindly Russian Mir space station, can be seen above the planet's limb. The bright spot to the right of Mir is Earth's very large natural satellite, The Moon. The Mir orbits planet Earth once every 90 minutes about 200 miles above the planet's surface or about 4,000 miles from Earth's center. The Moon orbits once every 28 days at a distance of about 250,000 miles from the center of the Earth. 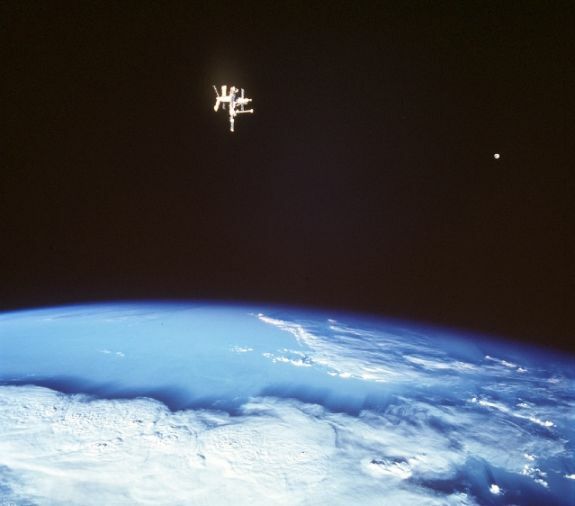 Russia now plans to deorbit the Mir space station after 15 years of operation. Centaurus, the Centaur, is one of the most striking constellations in the southern sky. The lovely Milky Way flows through this large constellation whose celestial wonders also include the closest star to the sun, Alpha Centauri, the largest globular star cluster in our galaxy, Omega Centauri, and the closest active galaxy, Centaurus A. 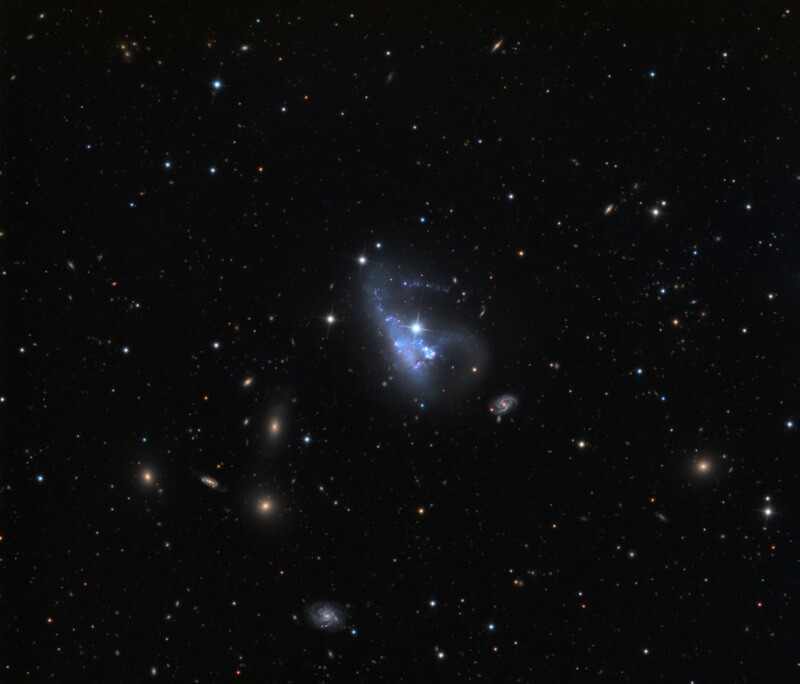 Embraced by tightly wound spiral arms of bright blue star clusters, this gorgeous galaxy - cataloged as ESO 269-57 - also falls within Centaurus' borders. Seen behind a veil of foreground stars which lie within our own galaxy, this face-on spiral galaxy is about 150 million light-years away and 200,000 light-years across. The brighter foreground stars are marked by diffraction spikes caused by the telescope and yellow vertical stripes due to saturated digital camera pixels in the above Very Large Telescope image from the European Southern Observatory. Tantalizing wisps of more distant, faint galaxies are visible in the background. Sixteen hundred years ago, Hypatia became one of the world's leading scholars in mathematics and astronomy. Hypatia's legendary knowledge, modesty, and public speaking ability flourished during the era of the Great Library of Alexandria. Hypatia is credited with contributions to geometry and astrometry, and she is thought instrumental in the development of the sky-measuring astrolabe. "Reserve your right to think, for even to think wrongly is better than not to think at all," Hypatia is credited with saying. "To teach superstitions as truth is a most terrible thing." The Great Nebula in Orion can be found just below and to the left of the easily identifiable belt of three stars in the popular constellation Orion. This fuzzy patch contains one of the closest stellar nurseries, lying at a distance of about 1500 light years. In the above picture, the red region on the left consists of nebulae designated M42 and M43 and contains the bright Trapezium open cluster. The blue region on the right is a nebula primarily reflecting the light from internal bright stars. Recent observations of the Orion Nebula by the Hubble Space Telescope have located solar-system sized star-forming regions. One of the most spectacular solar sights is a prominence. A solar prominence is a cloud of solar gas held above the Sun's surface by the Sun's magnetic field. The Earth would easily fit under one of the loops of the prominence shown in the above picture. A quiescent prominence typically lasts about a month, and may erupt in a Coronal Mass Ejection (CME) expelling hot gas into the Solar System. Although thought by many to be related to the magnetic field, the energy mechanism behind a Solar prominence is still unknown. The large majestic Lagoon Nebula is home for many young stars and hot gas. 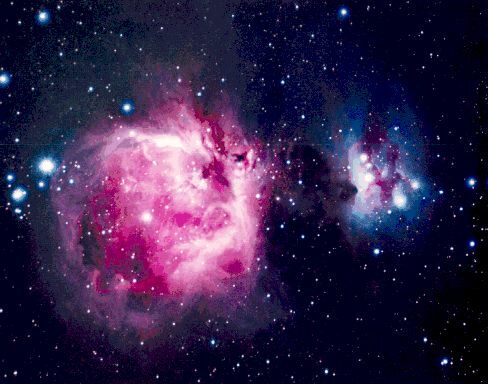 The Lagoon Nebulae is so large and bright it can be seen without a telescope. Formed only several million years ago in the nebula is the open cluster known as NGC 6530, whose young stars show their high temperature by their blue glow. The nebula, also known as M8 and NGC 6523, is named "Lagoon" for the band of dust seen to the left of the open cluster's center. A bright knot of gas and dust in the nebula's center is known as the Hourglass Nebula. Star formation continues in the the Lagoon Nebula as witnessed by the many globules that exist there.